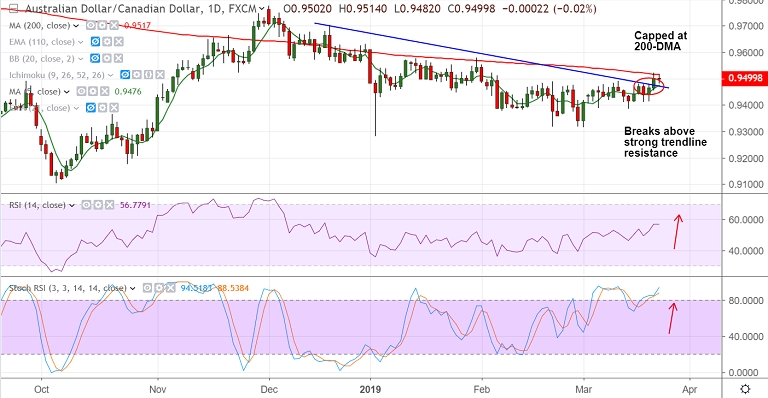 AUD/CAD struggles at stiff resistance at 200-DMA, edges lower from session highs at 0.9514. The pair is trading 0.06% lower on the day at 0.9496 at 0700 GMT. 200-DMA is major reistance at 0.9517 and decisive break above is required for further upside. RSI is above 50, bias higher. Stochs show bullish momentum and MACD supports further upside. The pair has edged above 110-EMA and breakout at 200-DMA could see gains till 0.9675. Retrace below 110-EMA and break below 55-EMA support could see downside.